Montréal-Mirabel International Airport was once planned to be a mega-sized hub airport serving the eastern Canadian metropolis of ​Montréal. For a variety of reasons this grand vision never materialized. In a three-part article, we present the fascinating story of Mirabel! In Part 1, we focus on the master plan and the assumptions underlying the planner's vision. Historically Montréal had been Canada’s largest city as well as its commercial and cultural center. During the 1960s, the city experienced an economic boom and Montréal's city leaders, led at the time by Mayor Jean Drapeau, were thinking big in terms of asserting the city's status as a prestigious forward-looking metropolis. During that decade several of the city's tallest skyscrapers were constructed as well as a network of expressways and subway lines; infrastructure that the city still relies upon to today. The enormous success of the Expo 67 World's Fair held in Montréal was one of that era's crowning achievements. 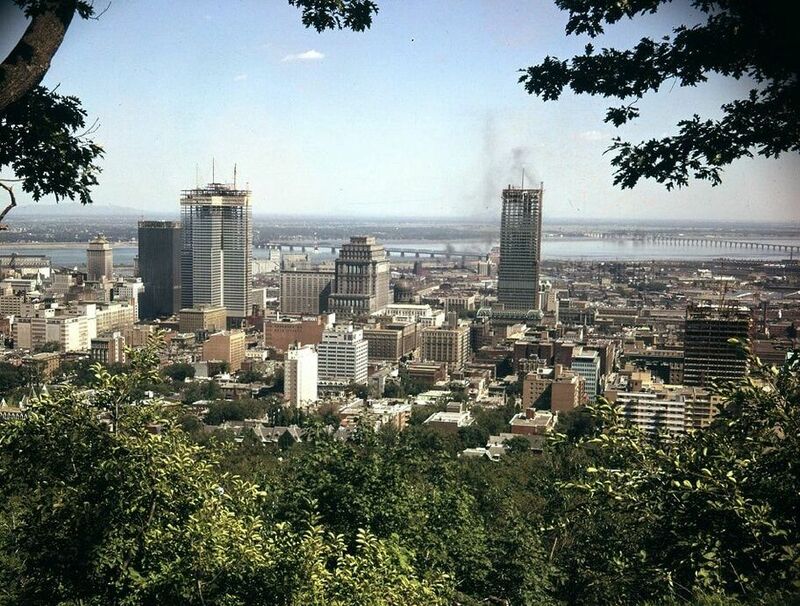 In 1970, Montréal was awarded the 21st Summer Olympics, to be held in 1976. The city seemed invincible as the epicenter of enterprise and culture for Québec and the whole of Canada. It was forecast that airline passenger traffic would double every eight years. 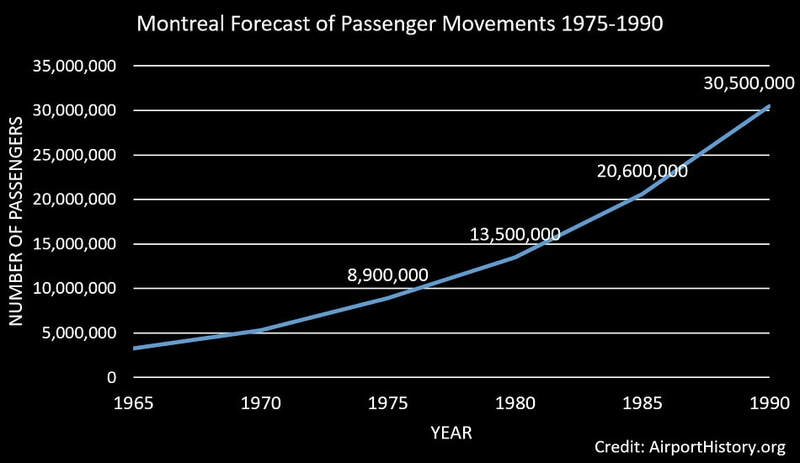 Due to the boom, passenger traffic at the city's international airport at Dorval was growing at double-digit rates. 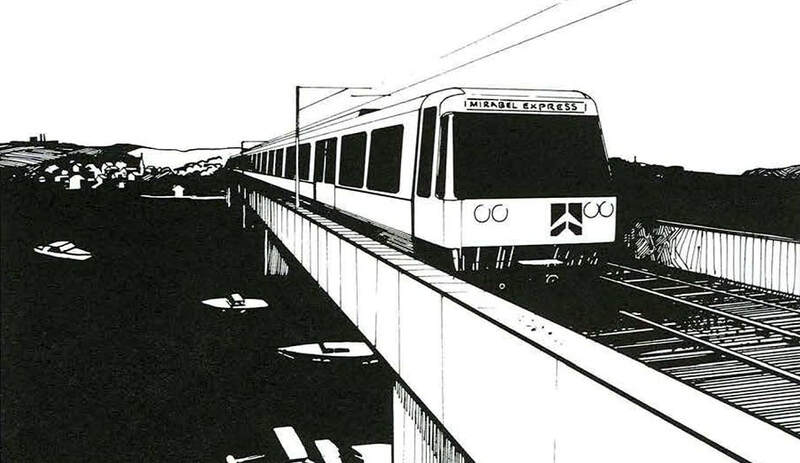 In 1965, Dorval handled 3.3 million million passengers, 16.7% more than the previous year. Five years prior, the airport had been expanded with a brand new terminal complex and a third runway. However, it was clear that planners already needed to consider the next round of expansion. 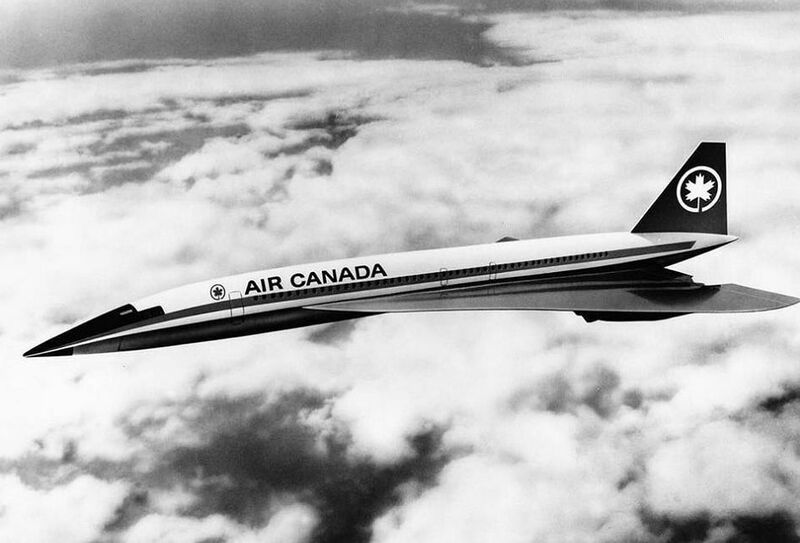 In 1966 and 1967, Canada's Department of Transport carried out a number of planning studies of the city's air transport requirements over the next 25 to 30 years. According to one study, airline passenger traffic would double every eight years. According to this scenario, passenger movements would reach 20.6 million by 1985 and 30.5 million by 1990. It was also forecast that air cargo would double every three or four years and general aviation would double every ten years. 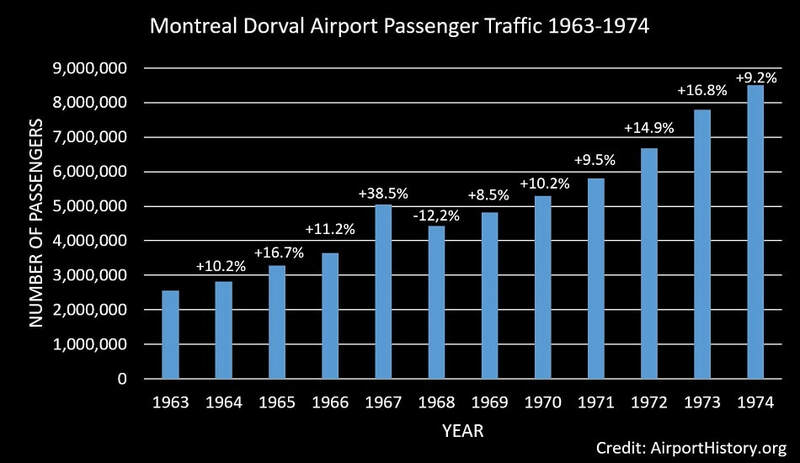 ​​Another study revealed that Dorval Airport would reach a saturation point by 1975, and that even if it was expanded, it would reach its maximum capacity by 1985. Beyond that, an additional runway would need to be built, which would require the acquisition of very expensive land. Even more critical would be the noise problem that would come with the increased air traffic. In the late 1960s, people living near the airport were already protesting against existing noise levels and demanding action from the federal government. Restrictions were imposed on night flights at Dorval. This alleviated problems somewhat, but with the growth of traffic and the large-scale introduction of wide body and supersonic jetliners on the horizon, a long-term solution was needed. 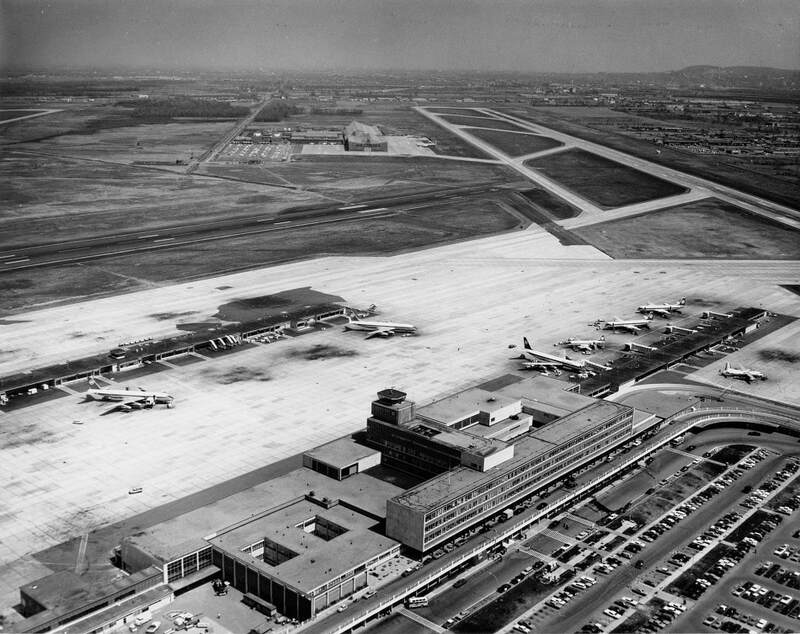 After weighing all the factors involved, the government decided in 1968 that the future aviation needs of the Montréal area could only be met by the construction of a new international airport, one which would be suitable for the new generation of aircraft and the largely unknown demands of the 21st century. The airport would be called Mirabel, named after a local farm owned by one of the original 19th century settlers. The Canadian Department of Transport studied five possible sites for the new airport. 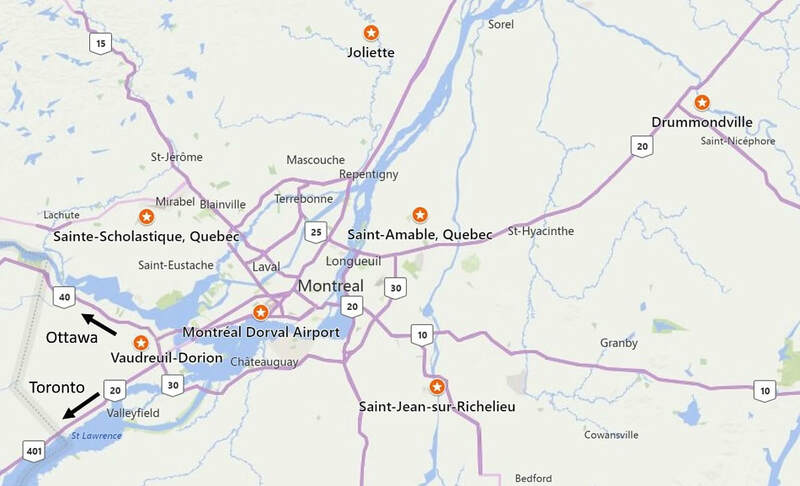 The federal government proposed that the airport should be located at Vaudreuil-Dorion, 25 miles (40 km) to the west of Montréal, just off Montréal Island. ​Instead, it preferred that the new airport would be situated at Drummondville, 68 miles (110 km) to the east of Montréal and deep inside the French-speaking Québec countryside. The new generation of wide-body aircraft had to be brought close to the terminal so as to efficiently load passengers and cargo, but also needed plenty of space to maneuver because of their size. 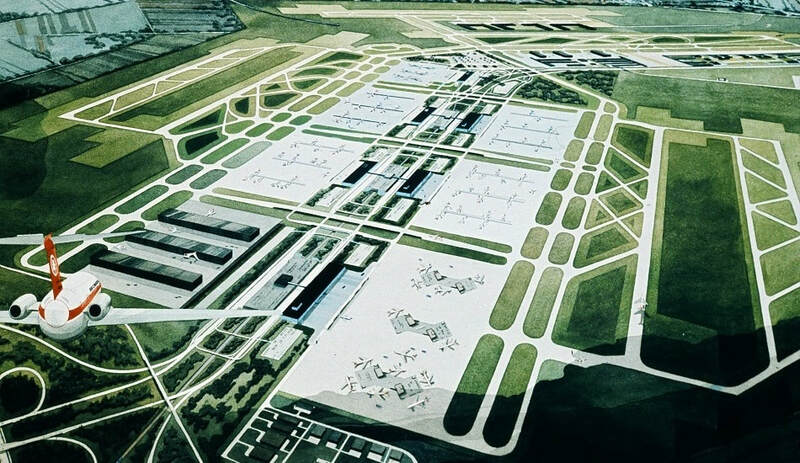 For inspiration, planners looked at the giant new jetport proposed at the time for the cities of Dallas and Fort Worth, Texas. That airport incorporated the concept of a center spine road, which brings a main artery for surface transport right down the middle of the airport. 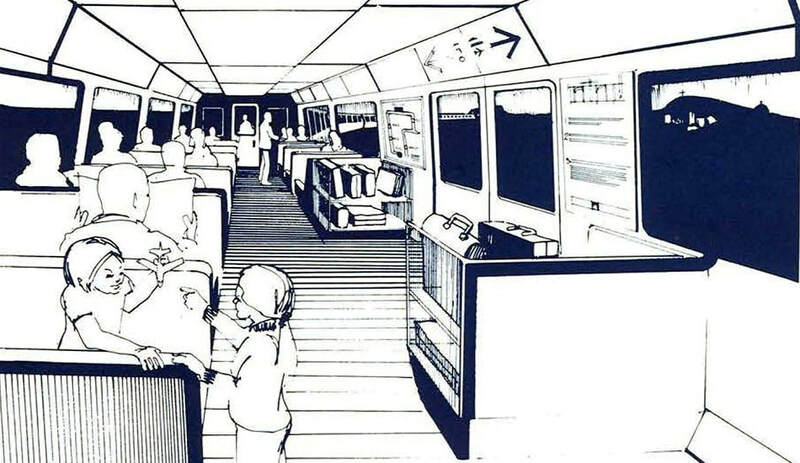 ​Rather than one large passenger terminal, a number of decentralized terminals were arranged around the spine road. Each terminal was to be operated by a major airline or a number of smaller ones. Mirabel's capacity was to be 60 million passengers and several million tonnes of cargo annually. 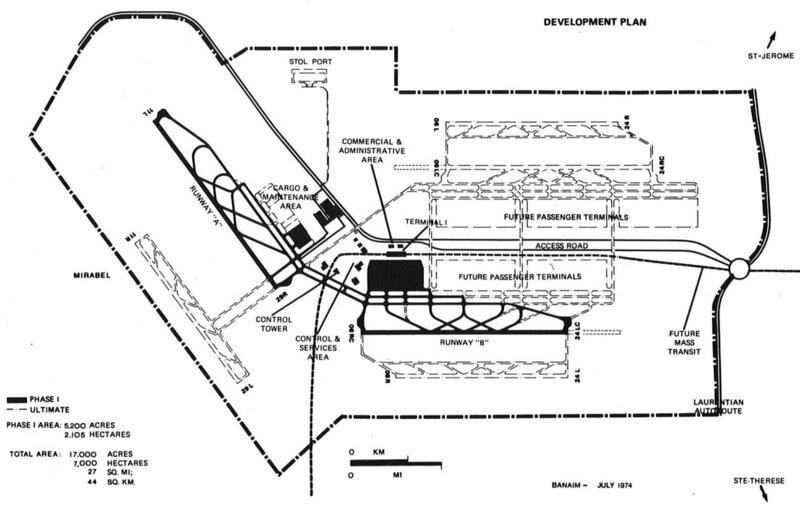 The Mirabel master plan provided for a total of six runways. Together these provided a capacity of than a 160 landings and takeoffs per hour or 630,000 movements per year. The runways were arranged in three sets of parallel pairs: two pairs in the direction of the predominant winds (northeast-southwest) and one pair in the crosswind (east-west) direction. ​All runways were planned for widths of 200 feet (61 meters) and length from 10,000 feet (3,048 meters) up to 15,000 feet (4,572 meters). The plan provided for the construction of a total of six passenger terminals, each with a handling capacity of six to ten million passengers annually. ​There were also provisions for an extensive cargo and aircraft maintenance areas, a STOL-port, a general aviation area and an airport industrial park. Similar to the scheme proposed for Dallas/Fort Worth International Airport, all facilities could be accessed from a central spine road, which could be expanded to up to eight lanes. A reservation was made in the median of the spine road for an automated people mover (APM) system connecting the six passenger terminals. 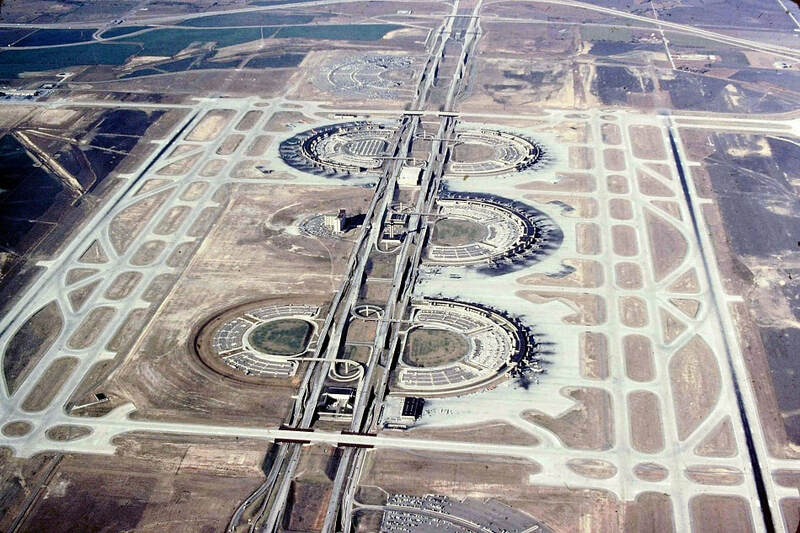 The total operational zone of the airport was 17,000 acres (6,879 hectares), slightly smaller than the size for the proposed Dallas/Fort Worth Airport. The total passenger handling capacity was to be 60 million passengers and several million tonnes of cargo annually, a volume which was expected to be reached by the year 2025. The entire complex would be completed by the year 2000 at an estimated cost of CAD 300 million. Mirabel was to planned be developed in phases. The first phase included two 12,000-foot (3,658 meter) runways, a passenger terminal building with a handling capacity of six to ten million annual passengers and two cargo terminals with a combined capacity of 600,000 tonnes annually. Also included were facilities such as a 215-foot-high (65.5 meters) air traffic control tower, the highest in Canada, a car parking garage with a capacity of 6,000 cars, a 350-room hotel and an airport administration building. The most controversial part of scheme was the establishment of a huge buffer zone around the airport which was meant to provide a buffer against noise and safeguard the airport’s future development. Most of the land would be dedicated to agriculture. Another section would be used to establish an airport industrial zone. 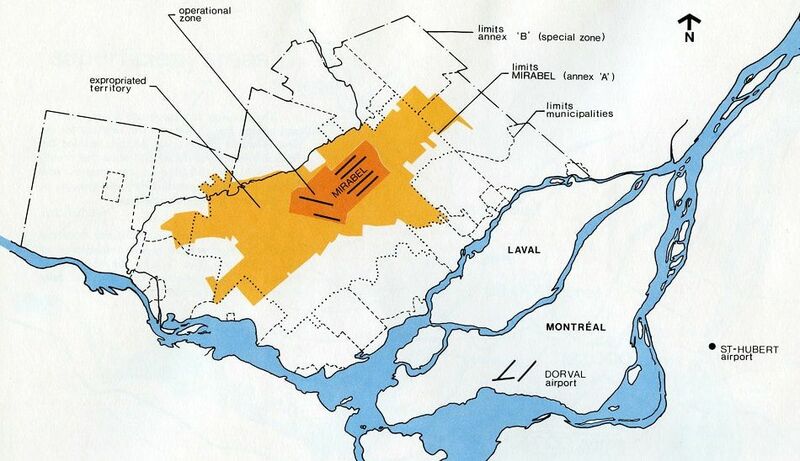 In total, an area of 97,000 acres (39,250 hectares), an area the size of the island of Montréal, was expropriated to make way for the airport and the buffer zone, affecting 2,700 families. 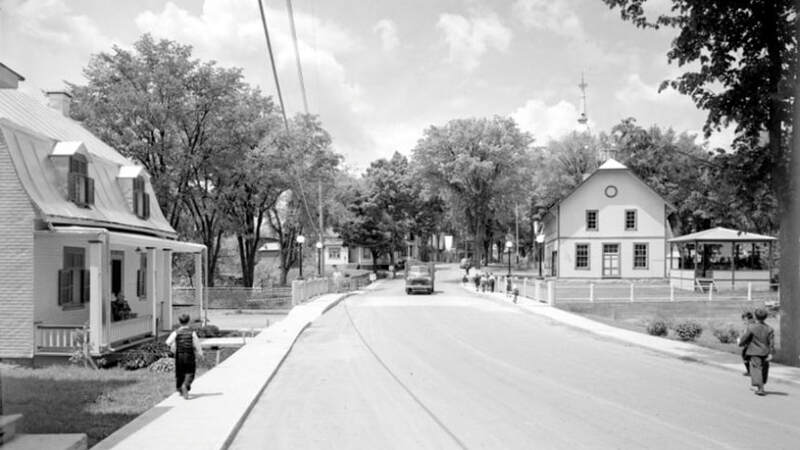 One hundred and fifty-seven property owners had to move to make way for the initial construction. The others were allowed to remain and given ten-year renewable land leases. ​The expropriation resulted in making Mirabel the world's largest airport by property area, a record which it retained until 1999, when King Fahd International Airport near Damman in Saudi Arabia surpassed Mirabel. 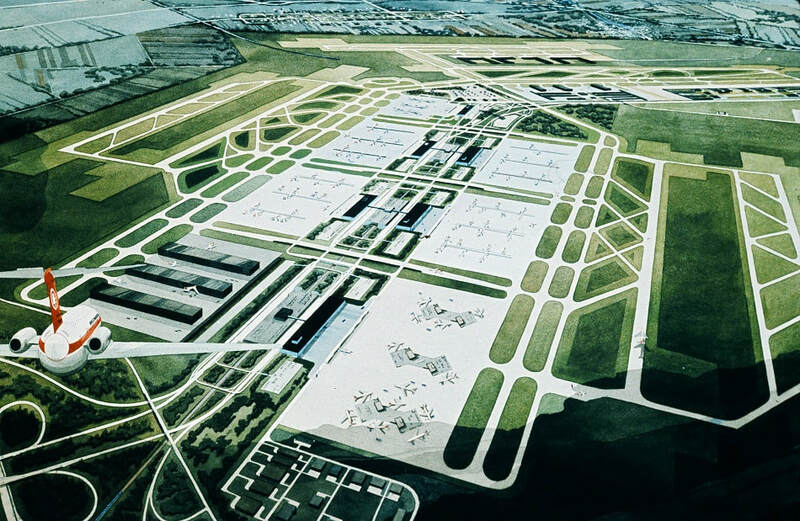 ​The expropriation resulted in making Mirabel the world's largest airport by property area. ​Even with improved highways, during rush hour, the driving time from Montréal to Mirabel would still be an hour. 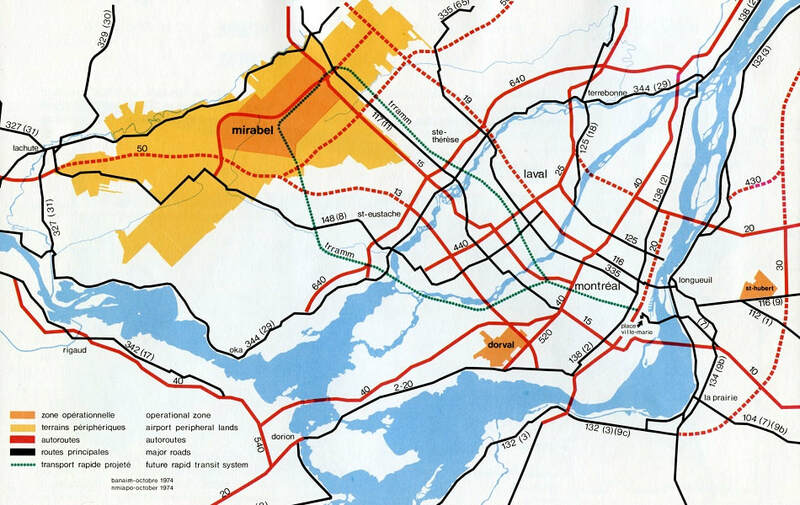 Several new expressways were planned, the most important one being Route 13, a six-lane tollway connecting Mirabel to Montréal's western suburbs and the existing airport at Dorval. Another proposed expressway would connect Mirabel with Ottawa, some 90 miles (152 kilometers) away, thereby making Mirabel a viable alternative for inhabitants of Canada's capital city. Even with improved highways, during rush hour, the driving time from Montréal to Mirabel would still be an hour. Hence, it was of paramount importance to develop a rail alternative. To address this need, a high-speed light rail to downtown Montréal to Mirabel was planned, called TRRAMM (Transport Rapide Régional Aéroportuaire Montréal Mirabel). If future ground access ever approached a condition of traffic saturation throughout the region, STOL (Short Take Off and Landing) aircraft could offer a viable alternative to the surface movement of passengers to and from the airport. Therefore, a provision was made to accommodate STOL aircraft, including the development of a landing strip of 2,000 by 150 feet (610 by 46 meters) in the northwestern corner of the airport. STOL facilities would be provided with convenient access to the passenger terminals and the TRRAMM system. ​STOL aircraft could also be used to provide connecting flights to and from Ottawa and Quebec City for international traffic. The service could even be extended to Toronto as well with the advent of high-speed, high-capacity STOL aircraft being developed by the Canadian aviation industry at the time. This concludes Part 1. In Part 2, to be posted soon, we will take a look at the plans for Mirabel's first-phase development, including the design for the passenger terminal building. What's your opinion about the planners' vision for Mirabel? Did you fly through Mirabel? Share your experiences below! If you have some interesting background information or images that can help improve this story, send us an email. -Allen, Roy. Major Airports of the World. 2nd ed., Ian Allan Ltd, 1983. -Development of the new Montreal International Airport. Transport Canada, 1974. ​-Dawson, Phil. Twice Adieu from Montréal. Airways Magazine, June 2005, p. 44-47. -Dawson, Phil. Montréal's Mirabel Airport: Toward a New Future. Airways Magazine, December 1998, p. 47-54. -Giannico, Paolo. Mirabel International Airport: The End of an Era. Airliner World, January 2005, p. 45-47. -Giannico, Paolo. Montréal - Mirabel International Airport (YMX): The Airport Where "The Future Has Gone By". Airliners, January/February 2008, p. 62-66. -McGrath, Tim M. History of Canadian Airports. Ministry of Supply and Services, 1984. -Pigott, Peter. Gateways: Airports of Canada. Pottersfield Press, 1996. -Stroud, John. Airports of the World. Putnam, 1980.